Last month I've blogged a bit about what the important SOCIAL factors are in creating corporate social networks. Today my colleague Patrick Savalle published a first presentation on the TeamPark approach which is designed to help organisations successfully implement corporate social networks and become more intelligent organisations. In every organization processes can be identified that do not function optimal in the normal, so called bureaucratic or formal structure. Finding people or expertise, sharing and leveraging implicit knowledge, exploiting the wisdom of the crowd, using the special talents of people, driving sustainable innovation. Many processes run more efficient and are more effective using the social networks of the organisation. Many tasks can be accomplished better by organizing people in communities instead of teams. An organization that knows how to use communities, social networks, crowd-sourcing, broadcast communication, self-organization and other ‘2.0’ concepts has an advantage over competitors and offers an appealing working environment. View more presentations from patricksavalle. At the SlideShare presentation you'll also find a transcript to go with the presentation. TOKYO, Mar. 24 -- Genkii today announced Sparkle IM, an easy-to-use chat and communication tool for the iPhone and iPod Touch that allows you to access the Second Life and Opensim virtual worlds over Wifi or 3G networks. "Second Life and Opensim rely on high-end computing hardware and broadband for a full, immersive virtual world experience," says Ken Brady, CEO of Genkii. "But what about when you're away from your computer, at school, at work, traveling, or when you simply don't have the time to launch the full application?" Sparkle IM allows you to do exactly that. You can use the following features immediately: send and receive IMs, send and receive offline IMs, region chat, send teleport requests, accept friend requests, and change your start location. Sparkle IM supports Second Life, SL Beta Grid, OSGrid (Opensim), and any other custom server connection compatible with Opensim/SL.Sparkle IM launches with a special introductory price of $4.99 and is available in the iTunes App Store. As we develop new features, Genkii will post additional announcements and information at http://sparkle.genkii.com/. Founded in Tokyo in 2008, Genkii is a cutting-edge group of geeks working on a wide variety of mobile, virtual world, and social media applications. It's been around for a while, but somehow it hasn't reached critical mass yet in Europe. 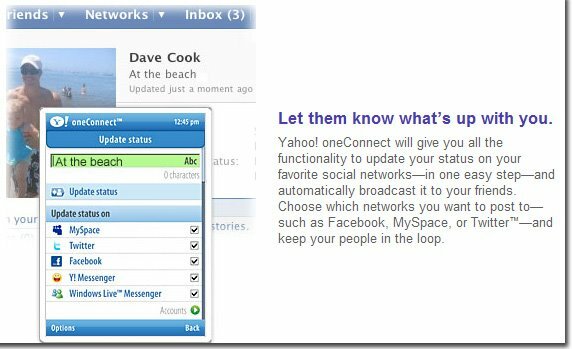 It was not untill yesterday that I noticed Yahoo had a nice new app out on the web: oneConnect. It was launched as early as februar this year. 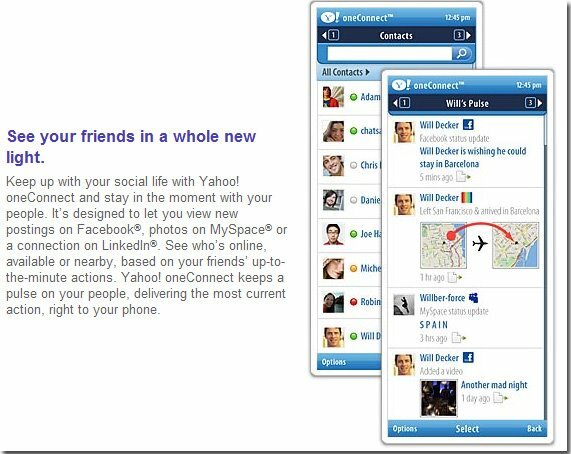 Yahoo has upped the ante in its campaign to rule the mobile Web. Okay, here we go again. Time for yet another tribal migration, another MeToo social networking app where we can leave our personal data up for grabs. 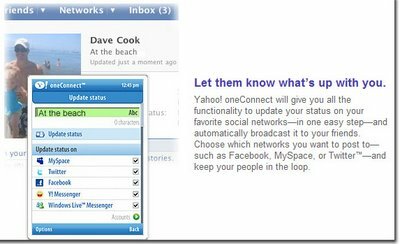 Right now every new web 2.0 app is about converging streams, plugging things into something else, creating more of the same data stream, to pretty much the same people. Why is this different than say Facebook, or Plaxo? Let's have a look at some of the features. There is a distinct difference. oneConnect does connect. It doesn't require building a new profile like Facebook, LinkedIn and Facebook. 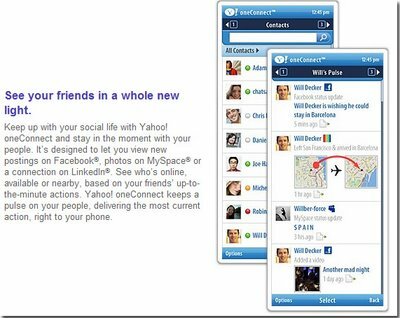 It simply leverages my existing social networks in their current states which saves me going through the hassle of importing contacts and extensive profiling once more. oneConnect services the usual stuff, converging contacts and lifestreams from multiple sources, but also adds some new features into the mix. This is what I consider oneConnect's biggest advantage over the existing competition, it allows you to post across different platforms. Better yet, it let's you select which platform you want to push your content to. And although we often use these platforms for specific purposes, often we'd like to update our status to all of our networks, or just to announce a new blogpost without starting up Pownce, Twitter and Jaiku. 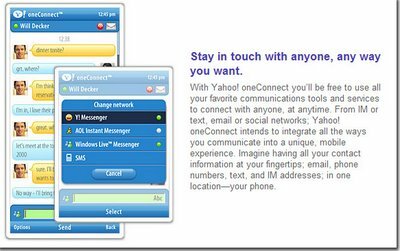 Another new one (to my knowledge) in the social space is the integration with Instant Messaging applications making oneConnect one of the most versatile communication platforms out there at the moment. 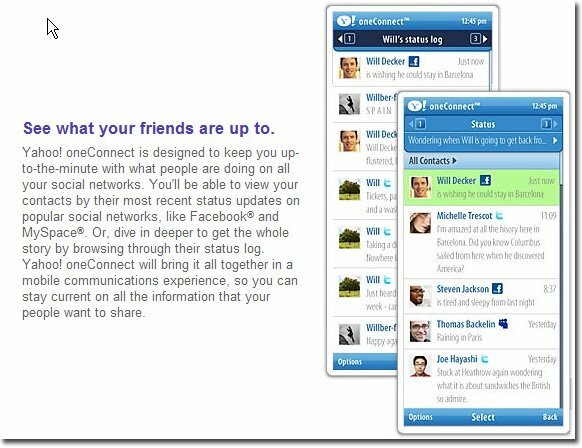 Now does this all make oneConnect the next killer app for the web? Not yet. It isn't stable yet, it's buggy and has performance issues. It doesn't support enough feeds or services yet and you're pretty limited in the amount of contacts you can add. Aside from the number of feeds and sources to leverage, there are a few other things that are still lacking to get the next revolution going. We still need some innovation to make the next level of social networking. Yes, oneConnect has some nice extra features over other lifestream aggregators and social portals but it isn't enough to herald a new massive tribal migration on the web just yet.